We offer cone beam CT scans right in the comfort of our office. With our new Kodak CS9300 cone beam CT scan, we can obtain highly accurate 3-dimensional images of the jaws, teeth, and supporting structures to provide treatments more precisely and safely. The scan takes less than a minute to complete with digital images available immediately for evaluation. Our cone beam CT scan provides 3-D images in seven different field views. This means that we have the ability to limit the scan to small areas of interest to avoid unnecessary radiation exposure. The images are available immediately for review and can be reconstructed into 3-dimensional exact replica of your jaw or teeth structures. Images are easy to share and significantly less costly than traditional CT scans. What CBCT is Used for? Dental implant planning- With CT scans, we can diagnose bone conditions for placement of dental implants as well as plan for proper implant positioning. We use special software that reconstructs our CT scan images into 3-dimensional models which in turn is used to complete our virtual implant placement and planning. This provides for highly accurate and safe placement of dental implants and restorations. Third molar surgery- CT scans provide us with exact position of the impacted third molars and their relationships to sensory nerves, sinuses, and other vital structures in proximity. With this information, we can provide better informed consent, safer, and more predictable surgical outcomes. 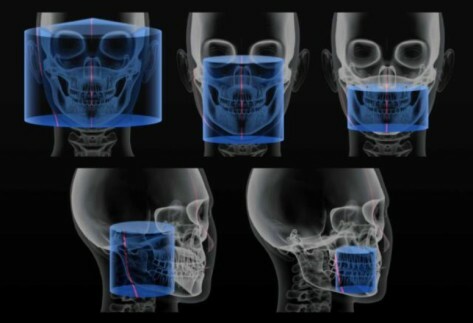 Cone Beam CT scan (CBCT) is taken to evaluate exact relationship of the lower wisdom teeth to the nerve. Exposure of impacted teeth- Using CT scan, we can precisely locate impacted teeth, like canines, that require exposure for orthodontic eruption. Jaw cysts or other forms of pathology- CT scans are often necessary for diagnosis of jaw cysts and other forms of pathologies and guiding the surgeon in the optimal approach for treatment. Fractures- We can use CT scan for diagnosis of oral and facial fractures and help choose the appropriate treatments. As with any x-ray imaging, there is some exposure to radiation. However, our CT scan emits significantly less radiation than medical CT scans and only slightly higher than a dental full mouth series of X-rays or a panoramic X-ray. Dr. Kazemi recommends the CT scan only when it offers diagnostic benefits and better surgical outcomes and not done routinely in every patient. The CT is $295.00 for any size study. We can share your CT scan with your dentist or other healthcare professionals at no additional cost. Some insurances may offer benefit for CT scans. We will provide you with insurance claim form for easy self reimbursement. 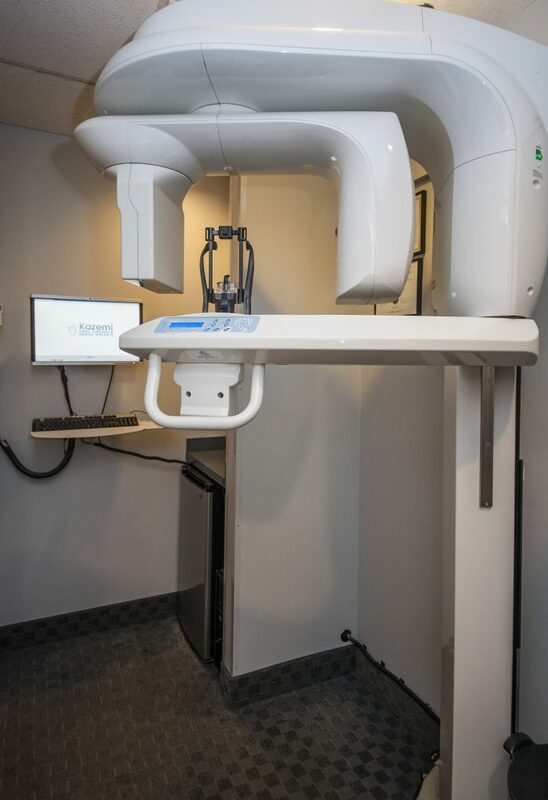 The CBCT is obtained with our state-of-the-art CareStream in-office cone beam CT scan unit. The entire process takes less than 5 minutes. The CBCT study can be placed on a disc or sent via cloud sharing.